If you’re looking for the best bathtub sliding glass doors, we found some of the most sought after bathroom doors on the market. These final picks are highly rated in terms of style, quality and durability. Furthermore, these picks all range in style from modern to classic. Therefore, chances are, there is one on this list that speaks to you. So, how did we narrow down our 6 picks for best bathtub sliding glass doors? Well, we are big on style. Therefore, we chose bathtub doors that have a beautiful aesthetic and a style which will last decades to come. The next thing we looked for when narrowing down our list for best bathtub sliding glass doors is quality. So, not only are our final picks made with materials that will withstand the saturation of the bathroom, they are made for longevity. Furthermore, when it comes to the bathroom, safety is important. And, each pick on our list is made of glass. Therefore, to ensure a not so shattering experience, these doors are all constructed of thick, tempered safety glass which is much less likely to break than normal glass. In addition, since this is the bathroom and things get rather damp, our final picks are all constructed with materials which will help prevent rust and corrosion. Some of these materials include stainless steel and chrome plating. 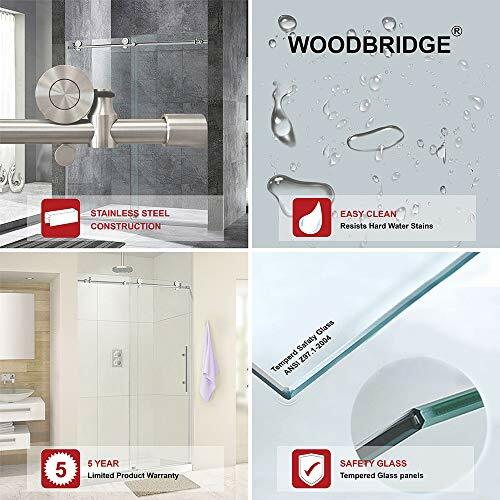 And, some of our final picks for best bathtub sliding doors offer stain resistant and water-repellent coating on the glass. So, if you prefer the idea of not having to squeegee the shower after every use, we suggest narrowing in on these picks. That being said, below you will find our list for the best bathtub sliding glass doors. And, these bathtub doors have some of the highest ratings on the market and have been consumer tested and raved about. Of course, if we are going to dole out the dough, we expect nothing but the best for our final picks. Lastly, if you need some information on how to measure your space for the best fit, you can follow this link here for a simple and easy way to do this. Our first pick for best bathtub sliding glass doors can be purchased as a left side installation or a right side installation. Therefore, if you want to enter the tub on the left hand side, you will want to go with the right side installation. If you want to enter the tub on the right hand side, you will want to go with the left side installation. And, usually, the side that has the maximum amount of open space is the most appropriate side to enter the tub. The DreamLine Mirage-X Frameless Sliding Tub Door is available in your choice of Brushed Nickel hardware or Chrome hardware. In addition, this bathtub sliding glass door measures 56-60 inches wide by 58 inches tall. And, the guard rail on the bottom can be trimmed up to 4 inches to ensure the perfect fit. This bathtub sliding glass door features 3/8 inch tempered glass. And, according to Scientific American, tempered glass is about 4 times stronger than ordinary glass. In addition, Do it Yourself states that tempered glass is durable and its use is to avoid potential danger when it breaks. Therefore, tempered glass is crucial for a place like the bathroom. Lastly, the DreamLine Mirage-X Frameless Sliding Tub Door is treated with ClearMax coating. Clearmax coating helps to resist water marks and is stain resistant. And, the beauty of this is, it is less cleanup for you. This means no more squeegee and no more wiping the bathtub doors after each use. We really love the sleek, minimal design of this bathtub sliding glass door. And, it is the most minimal bathtub sliding glass door on our list. Furthermore, the DreamLine Mirage-X Frameless Sliding Tub Door gets high ratings for quality and durability from many satisfied consumers. And, these shower doors slide smoothly and quietly. Lastly, installation is relatively easy. This bathtub sliding glass door only comes in one size. Therefore, depending on your measurements, you may be out of luck. This pick for best bathtub sliding glass door measures 56 to 60 inches wide and a whopping 62 inches tall. Furthermore, it comes with Brushed Nickel hardware. And, speaking of hardware, this bathtub door features stainless steel construction. And, stainless steel is a great material for the bathtub as it is rust and corrosion resistant. In addition, it is highly durable and chip resistant. The WOODBRIDGE Frameless Sliding Bathtub Door is made of 3/8 inch thick tempered glass. And, like we stated above, tempered glass is a safe and durable alternative to ordinary glass. This bathtub sliding glass door can be right or left installed. Therefore, whichever side you wish to enter on, this door can accommodate you. Lastly, the WOODBRIDGE Frameless Sliding Bathtub Door features large rollers which allow the door to operate smoothly and quietly. And, like the rest of the hardware, these rollers are stainless steel. Therefore, they are durable and corrosion resistant. This bathtub sliding glass door is made with high quality materials, including stainless steel. Furthermore, the operation of the door works flawlessly and quietly. And, it offers right or left installation, therefore, one less thing to figure out. The WOODBRIDGE Frameless Sliding Bathtub Door is rather difficult to install. Therefore, we recommend having it professionally installed. In addition, this bathtub door only comes in one size and one finish. This pick for best bathtub sliding glass doors is as classic as you can get. Furthermore, they are reminiscent of the mid-century modern from the 80’s and 90’s. And, when you add classic with a mid-century take, you can’t go wrong. These doors will remain in style for decades. This Basco Deluxed Framed Sliding Tub Door is meant for privacy. However, you can also opt for Clear Glass or Rain Glass. And, Rain Glass is a lot like the glass pictured above, just in a different pattern. In addition, you also have your choice of finishes. Choose between Brushed Nickel, Oil-Rubbed Bronze or Silver. The Basco Deluxed Framed Sliding Tub Door has the ability for left or right installment. And, this door measures 56 inches wide by 56 inches wide. This bathtub sliding glass door features .188 inch thick tempered glass. And, like we mentioned above, tempered glass is durable and will help keep you safe in a seemingly not-so-safe scenario. Furthermore, if the glass were to happen to break, it would break in large, dull pieces. Therefore, there’s really nothing to worry about with tempered glass. Lastly, the Basco Deluxed Framed Sliding Tub Door is completely rust and corrosion resistant. You really can’t go wrong with this bathtub door. It’s classic, durable and no frills. In addition, this bathtub door has finish options and privacy options. Lastly, it is relatively easy to install. Just allow yourself a little bit of time. The Basco Deluxed Framed Sliding Tub Door only comes in one size. This pick is a bypass door. Therefore, the doors can cross each other and you can enter on either side. And, the added bonus about this is, you don’t have to worry about right or left installation. The DreamLine Encore H Semi-Frameless Bypass Tub Door measures 56 inches to 60 inches wide by 58 inches tall. And, it comes in your choice of finishes. Choose between Brushed Nickel, Chrome, Oil-Rubbed Bronze or Satin Black. This bathtub sliding glass door features 5/16 inch thick tempered glass. And, this glass comes with ClearMax coating which will deter water and stains from appearing on the glass. Therefore, with this pick for best bathtub sliding glass doors, you won’t need to squeegee the doors after use. Lastly, the DreamLine Encore H Semi-Frameless Bypass Tub Door offers 2 towel bars. And, these towel bars double as handles for an easy entry and an easy exit. This bathtub sliding glass door operates very quietly and smoothly. In addition, this bathtub door is treated with ClearMax which helps to keep things low-maintenance. Lastly, the DreamLine Encore H Semi-Frameless Bypass Tub Door is quality built and it looks like million bucks. Installation is a 2 person job. And, we highly recommend getting it professionally done. That being said, the instructions for installation could use a bit of work. 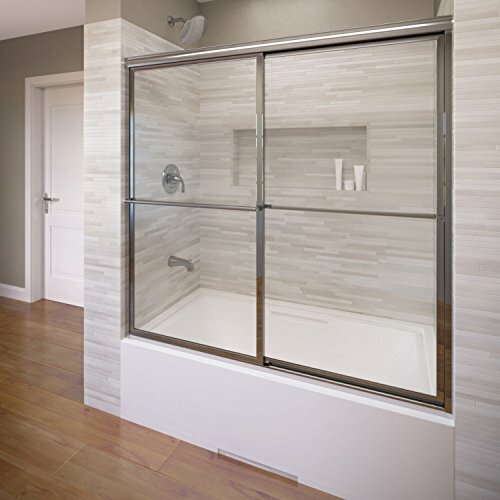 This bathtub sliding glass door can be installed on the left or the right. And, it is a frameless design with one fixed panel and one door which slides. The SUNNY SHOWER B038 New Frameless Sliding Bathtub Shower Door measures 56 inches to 60 inches by 62 inches tall. And, the top rail can be trimmed by up to 4 inches to meet the 56 inch minimum length. This bathtub sliding glass door is made with tempered glass. And, tempered glass, also known as safety glass, is approximately 4 times as strong as ordinary glass. Therefore, it is ultra durable and built with your safety in mind. 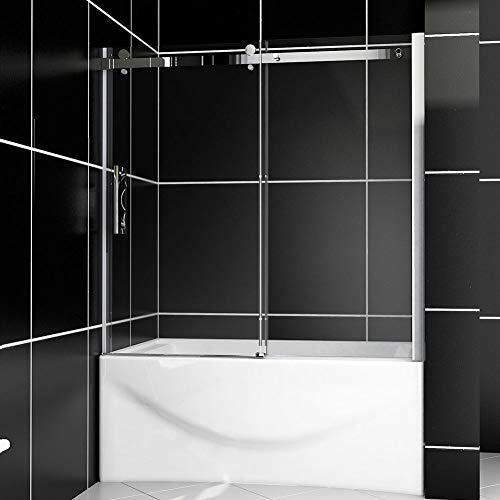 The SUNNY SHOWER B038 New Frameless Sliding Bathtub Shower Door features a stainless steel top rail and door handle. And, stainless steel is a great material for the bathroom as it is corrosion resistant. Lastly, this bathtub sliding glass door is offered in a chrome finish. This is a beautiful bathtub door and is made with quality and durable materials. In addition, it is taller than most bathtub doors. Therefore, this gives it an extra added touch of luxury. And, this bathtub door operates flawlessly and quietly. Where are the installation instructions? Some consumers state this bathtub door does not come with any instructions. And, this bathtub door only comes in one size and in one finish. Therefore, depending on your measurements and the rest of your fixtures, you may be out of luck. Our last pick for best bathtub sliding glass doors is another bypass option. And, this means the doors will intersect and you have the option of entering on the left or the right hand side. The SUNNY SHOWER Bypass Sliding Bathtub Shower Doors is a classic pick reminiscent of the mid-century style of the 80’s and 90’s. And, since this bathtub door is classic, this style will last for decades. This bathtub glass door is made with tempered safety glass. Tempered safety glass is more durable than ordinary glass. Furthermore, if this glass were to break, it would break in large, dull pieces. Therefore, this is paramount for your safety in the bathroom. The SUNNY SHOWER Bypass Sliding Bathtub Shower Doors comes with anodized aluminum and zinc alloy hardware. And, anodized aluminum is a great material as it doesn’t rust. In addition, because the aluminum is anodized, it is also corrosion resistant. Furthermore, according to The Balance, zinc alloy has high impact strength and is also corrosion resistant. This bathtub sliding glass door can be installed on the left or the right hand side. However, it is recommended you choose the area with the most open space when deciding what side to install it on. The SUNNY SHOWER Bypass Sliding Bathtub Shower Doors measures 56 inches to 60 inches wide and 57.375 inches tall. Lastly, this bathtub sliding glass door comes equipped with towel bars. And, these towel bars also double as handles. This bathtub shower door is a solid and durable piece. Furthermore, it is standard and classic in design and perfect for someone who wants something attractive but not too flashy. In addition, this bathtub sliding door is a bypass door. Therefore, you don’t really have to worry about left or right installation. The towel bars could be better quality. Furthermore, this bathtub shower door is rather difficult to install. Therefore, unless you really know what you are doing, we recommend hiring a professional. Lastly, the SUNNY SHOWER Bypass Sliding Bathtub Shower Doors only comes in one size and one finish.